Xuanzang (Chinese: 玄奘; Hanyu Pinyin: xuán zàng; Wade-Giles: Hsüan-tsang; Cantonese IPA: jyn4dzɔŋ1; Cantonese Jyutping:jyun4zong1) (602-644/664) was a famous Chinese Buddhist monk. Xuanzang was born near Luoyang, Henan in 602 as Chen Yi (陳褘 Ch’en I, yi1). He came from a scholarly family, and had three elder brothers. (Other texts had it that he had two elder brothers and an elder sister). He became famous for his seventeen year-long trip to India, during which he studied with many famous Buddhist masters, especially at the famous center of Buddhist learning in Nālanda.When he returned, he brought with him some 657 Sanskrit texts. With the emperor’s support, he set up a large translation bureau in Chang’an, drawing students and collaborators from all over East Asia. He is credited with the translation of some 1,330 fascicles of scriptures into Chinese. His strongest personal interest in Buddhism was in the field of Yogācāra (瑜伽行派) or Consciousness-only (唯識). The force of his own study, translation and commentary of the texts of these traditions initiated the development of the Faxiang school (法相宗) in East Asia. Although the school itself did not thrive for a long time, its theories regarding perception, consciousness, karma, rebirth, etc. found their way into the doctrines of other more successful schools. Xuanzang’s closest and most eminent student was Kuiji (窺基) who became recognized as the first patriarch of the Faxiang school. Less common romanizations of Xuanzang include Hhuen Kwan, Hiouen Thsang, Hiuen Tsiang, Hsien-tsang, Hsuan Chwang, Hsuan Tsiang, Hwen Thsang, Xuan Cang, Xuan Zang, Shuen Shang, Yuan Chang, Yuan Chwang, and Yuen Chwang. In Japanese, he is known as Genjō or Sanzō. Xuanzang, whose lay name was Chenhui, was born into a family possessing erudition for generations. He was the youngest of four children. His great-grandfather was an official serving as a prefect, his grandfather was appointed as professor in the Imperial College at the capital. His father was a conservative Confucianist who gave up office and withdrew into seclusion to escape the political turmoil that gripped China at that time. According to traditional biographies, Xuanzang displayed a superb intelligence and earnestness, amazing his father by his careful observance of the Confucian rituals at the age of eight. Along with his brothers and sister, he received an early education from his father, who instructed him in classical works on filial piety and several other canonical treatises of orthodox Confucianism. Although his household in Chenhe Village of Goushi Town (緱氏 gou1), Luo Prefecture (洛州), Henan, was essentially Confucian, at a young age Xuanzang expressed interest in becoming a Buddhist monk as one of his elder brothers had done. After the death of his father in 611, he lived with his older brother Chensu (later known as Changjie) for five years at Jingtu Monastery (淨土寺) in Luoyang, supported by the Sui Dynasty state. During this time he studied both Theravada and Mahayana Buddhism, preferring the latter. In 618, the Sui Dynasty collapsed and Xuanzang and his brother fled to Chang’an, which had been proclaimed as the capital of the Tang state, and thence southward to Chengdu, Sichuan. Here the two brothers spent two or three years in further study in the monastery of Kong Hui, including the Abhidharmakosa-sastra (Abhidharma Storehouse Treatise). 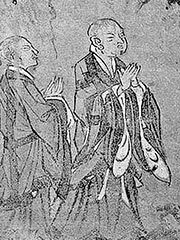 When Xuanzang requested to take Buddhist orders at the age of thirteen, the abbot Zheng Shanguo made an exception in his case because of his precocious knowledge. Xuanzang was fully ordained as a monk in 622, at the age of twenty. The myriad contradictions and discrepancies in the texts at that time prompted Xuanzang to decide to go to India and study in the cradle of Buddhism. He subsequently left his brother and returned to Chang’an to study foreign languages and to continue his study of Buddhism. He began his mastery of Sanskrit in 626, and probably also studied Tocharian. During this time Xuanzang also became interested in the metaphysical Yogacara school of Buddhism. In 629, Xuanzang reportedly had a dream that convinced him to journey to India. The Tang Dynasty and Eastern Gokturks were waging war at the time, therefore Emperor Tang Taizong of China prohibited foreign travel. Xuanzang persuaded some Buddhist guards at the gates of Yumen and slipped out of the empire via Liangzhou (Gansu), and Qinghai province. He subsequently travelled across the Gobi desert to Kumul (Hami), thence following the Tian Shan westward, arriving in Turfan in 630. Here he met the king of Turfan, a Buddhist who equipped him further for his travels with letters of introduction and valuables to serve as funds. Moving further westward, Xuanzang escaped robbers to reach Yanqi, then toured the Theravada monasteries of Kucha. Further west he passed Aksu before turning northwest to cross the Tian Shan’s Bedal Pass into modern Kyrgyzstan. He skirted Issyk Kul before visiting Tokmak on its northwest, and met the great Khan of the Western Gokturks, whose relationship to the Tang emperor was friendly at the time. After a feast, Xuanzang continued west then southwest to Tashkent, capital of modern day Uzbekistan. From here, he crossed the desert further west to Samarkand. In Samarkand, which was under Persian influence, the party came across some abandoned Buddhist temples and Xuanzang impressed the local king with his preaching. Setting out again to the south, Xuanzang crossed a spur of the Pamirs and passed through the famous Iron Gates. Continuing southward, he reached the Amu Darya and Termez, where he encountered a community of more than a thousand Buddhist monks. Further east he passed through Kunduz, where he stayed for some time to witness the funeral rites of Prince Tardu, who had been poisoned. Here he met the monk Dharmasimha, and on the advice of the late Tardu made the trip westward to Balkh (modern day Afghanistan), to see the Buddhist sites and relics. Here Xuanzang also found over 3,000 Theravada monks, including Prajnakara, a monk with whom Xuanzang studied Theravada scriptures. Prajnakara then accompanied the party southward to Bamiyan, where Xuanzang met the king and saw tens of Theravada monasteries, in addition to the two large Bamiyan Buddhas carved out of the rockface. The party then resumed their travel eastward, crossing the Shibar pass and descending to the regional capital of Kapisi (about 60 km north of modern Kabul), which sported over 100 monasteries and 6,000 monks, mostly Mahayana. This was part of the fabled old land of Gandhara. Xuanzang took part in a religious debate here, and demonstrated his knowledge of many Buddhist sects. Here he also met the first Jains and Hindus of his journey. He pushed on to Jalalabad, where he considered himself to have reached India. The year was 630. Xuanzang left Jalalabad, which had few Buddhist monks, but many stupas and monasteries. He passed through Hunza and the Khyber Pass to the east, reaching the former capital of Gandhara, Peshawar, on the other side. Peshawar was nothing compared to its former glory, and Buddhism was declining in the region. Xuanzang visited a number of stupas around Peshawar, notably the Kanishka Stupa. This stupa was built just southeast of Peshawar, by a former king of the city. In 1908 it was rediscovered by D.B. Spooner with the help of Xuanzang’s account. Xuanzang left Peshawar and travelled northeast to the Swat Valley. Reaching Udyana, he found 1,400 old monasteries, that had previously supported 18,000 monks. The remnant monks were of the Mahayana school. Xuanzang continued northward and into the Buner Valley, before doubling back via Shabaz Gharni to cross the Indus river at Hund. Thereafter he headed to Taxila, a Mahayana Buddhist kingdom that was a vassal of Kashmir, which is precisely where he headed next. Here he found 5,000 more Buddhist monks in 100 monasteries. Here he met a talented Mahayana monk and spent his next two years (631-633) studying Mahayana alongside other schools of Buddhism. During this time, Xuanzang writes about the fourth Buddhist Council that took place nearby, ca. 100 AD, under the order of King Kanishka of Kushana. This is disputed by some Theravadins. In 633, Xuanzang left Kashmir and journeyed south to Chinabhukti (thought to be modern Firozpur), where he studied for a year with the monk-prince Vinitaprabha. In 634 he went east to Jalandhara in eastern Punjab, before climbing up to visit predominantly Theravada monasteries in the Kulu valley and turning southward again to Bairat and then Mathura, on the Yamuna river. Mathura had 2,000 monks of both major Buddhist branches, despite being Hindu-dominated. Xuanzang travelled up the river to Srughna before crossing eastward to Matipura, where he arrived in 635, having crossed the river Ganges. From here, he headed south to Sankasya (Kapitha), said to be where Buddha descended from heaven, then onward to the northern Indian emperor Harsha’s grand capital of Kanyakubja (Kanauji). Here, in 636, Xuanzang encountered 100 monasteries of 10,000 monks (both Mahayana and Theravada), and was impressed by the king’s patronage of both scholarship and Buddhism. Xuanzang spent time in the city studying Theravada scriptures, before setting off eastward again for Ayodhya (Saketa), homeland of the Yogacara school. Xuanzang now moved south to Kausambi (Kosam), where he had a copy made from an important local image of the Buddha. Xuanzang now returned northward to Sravasti, travelled through Terai in the southern part of modern Nepal (here he found deserted Buddhist monasteries) and thence to Kapilavastu, his last stop before Lumbini, the birthplace of Buddha. Reaching Lumbini, he would have seen a pillar near the old Ashoka tree that Buddha is said to have been born under. This was from the reign of emperor Ashoka, and records that he worshipped at the spot. The pillar was rediscovered by A. Fuhrer in 1895. In 637, Xuanzang set out from Lumbini to Kusinagara, the site of Buddha’s death, before heading southwest to the deer park at Sarnath where Buddha gave his first sermon, and where Xuanzang found 1,500 resident monks. Travelling eastward, at first via Varanasi, Xuanzang reached Vaisali, Pataliputra (Patna) and Bodh Gaya. He was then accompanied by local monks to Nalanda, the great ancient university of India, where he spent at least the next two years. He was in the company of several thousand scholar-monks, whom he praised. Xuanzang studied logic, grammar, Sanskrit, and the Yogacara school of Buddhism during his time at Nalanda. Xuanzang was known for his strenuous translation of Indian Buddhist texts to Chinese, and subsequent recoveries of lost Indian Buddhist texts from translated Chinese copies. He is credited with writing or compiling the Cheng Weishi Lun as a commentary on these texts. He also founded the short-lived but influential Faxiang school of Buddhism. Additionally, he was known for recording the events of the reign of the northern Indian emperor, Harsha. In 646, under the Emperor’s request, Xuanzang completed his book «Journey to India in the Great Tang Dynasty» (大唐西域記), which has become one of the primary sources for the study of ancient history in India. This book was first translated into French by Sinologist Stanislas Julien in 1857. An English translation by Thomas Watters was published in London in 1905. Xuanzang’s journey, and the legends that grew up around it, inspired the Ming novel Journey to the West, one of the great classics of Chinese literature. The Xuanzang of the novel is the reincarnation of a disciple of Gautama Buddha, and is protected on his journey by three notorious monsters. One of them, the monkey, was a popular favourite and profoundly influenced Chinese culture and contemporary Japanese manga. In the Yuan Dynasty, there was also a play by Wu Changling (吳昌齡) about Xuanzang obtaining scriptures. A skull relic purported to be that of Xuanzang was held in the Temple of Great Compassion, Tianjin until 1956 when it was taken to Nalanda — allegedly by the Dalai Lama — and presented to India. The relic is now in the Patna museum. The Wenshu Monastery in Chengdu, Sichuan province also claims to have part of Xuanzang’s skull. Sally Hovey Wriggins. Xuan Zang: A Buddhist Pilgrim on the Silk Road. Westview Press, 1996.